It’s not work if you love what you do! Join our store team and enjoy flexible hours, an employee discount, and additional career opportunities. Talbots is a leading omni-channel specialty retailer of women’s clothing, shoes and accessories. Established in 1947, the company is known for modern classic style that’s both timeless and timely, fine quality craftsmanship and gracious service. At Talbots relationships are the key to our business, we hire individuals who bring new ideas to the table, understand smart risk taking and can enhance an already thriving culture. With a commitment to offer modern classic style for every body type, through a full range of sizes, inclusive to every woman in your life. LOFT is looking for some amazing talent to join their leadership team at The Street of Indian Lake. Are you passionate about fashion and ready to help motivate their team to keep reaching success!?! If this sounds like you, apply at anncareers.com! They’re waiting to hear from you! Hiring Assistant Manager. Apply in-store. 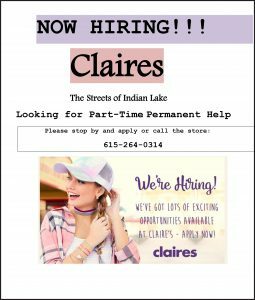 NOW HIRING at The Streets of Indian Lake! Looking for part-time permanent help. Looking for a new PLACE? The Children’s Place at The Streets of Indian Lake is hiring Part-time Associate. Inquire by calling 615.264.5630 or apply online at www.childrensplace.com. Make their PLACE your PLACE! Lane Bryant is hiring for part time sales associates for days, evenings and weekends for the Lane Bryant store located at The Streets. Call 615-431-3375 for more information. 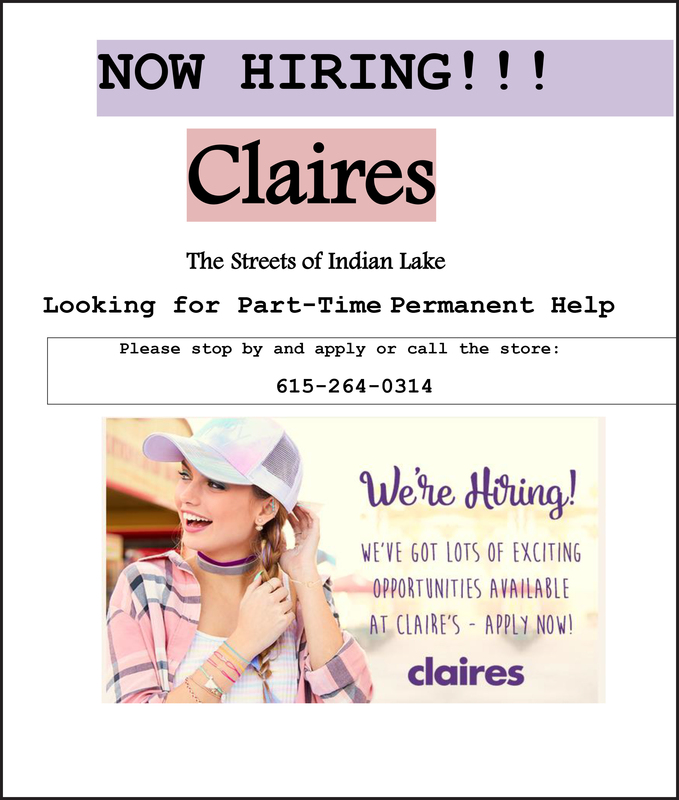 Check back for more job opportunities offered by the retailers at The Streets of Indian Lake!